Things have been very dull lately. Just work and home for the most part and knitting at night. I finished all of the sections and couldn't wait to put it together! I used a crochet slip stitch to join because I am faster with a hook than a darning needle. It created a ridge but there are so many ridges from picking up stitches that it really doesn't matter on the back. Also, I needed to create a ridge so the pattern would line up. I tried mattress stitch and whip stitch and both caused the squares to be slightly off from one another. Given the optical attractiveness of the pattern, it would have bugged the crap out of me with the squares being slightly off in the center. I still have some ends to weave in but its mainly along the seams which I can catch as a distraction from the border. So based on the expert opinion of Samie (NotYourGram'sAfghan), I decided to go with a camel colored border vs a navy border. That blue is bright in this picture, but in natural light is actually pretty dark and the colors would have been lost with the navy border. 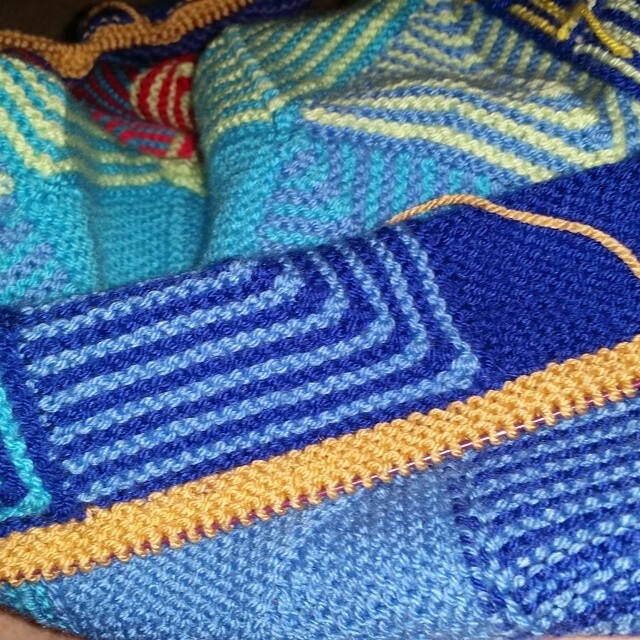 I have 3 garter ridges done so far. I am aiming for either 15 or 20 ridges and will make that call when I get that far. I do need to switch cable lengths again. I am using a cable that makes the needle set 60" long and its just too long. Need to switch to something a little shorter so the stitches move easier as I knit the rows. I did crochet two more Willow Square Blanket squares but failed to get a picture this morning before work. 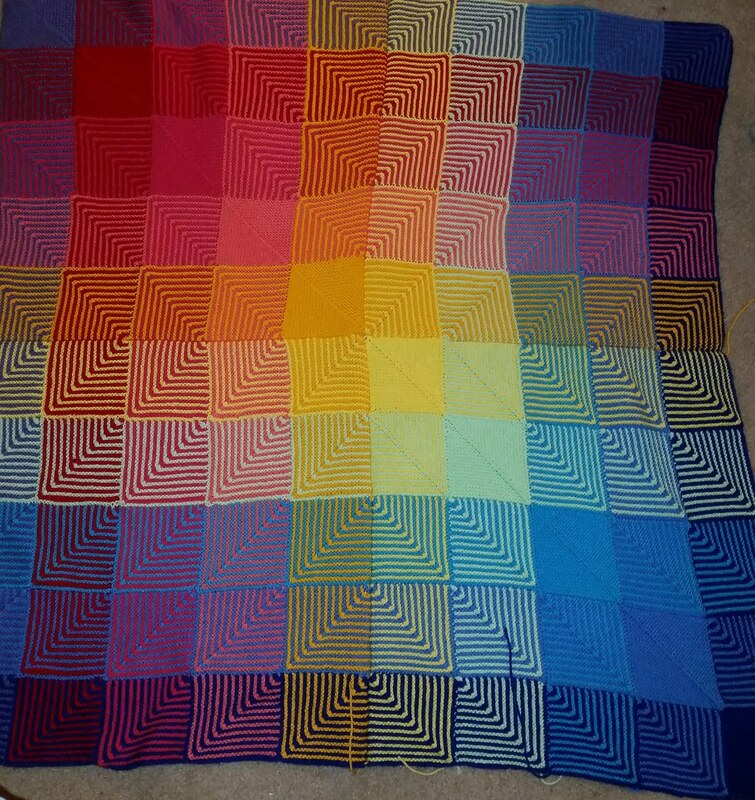 I hope that now all of my yarn is freed up from this blanket that I can get more done between border rows. Wow! It's kinetic...and very pretty! Lots of hours have gone into that gorgeous ghan! Good for you! Yes months of time have been spent. I am so excited for it to be finally done. Your blanket is amazing. I am in awe.